This version of goulash comes from the ethnic Hungarians who live in a region (Székely Land) which is now part of Romania. 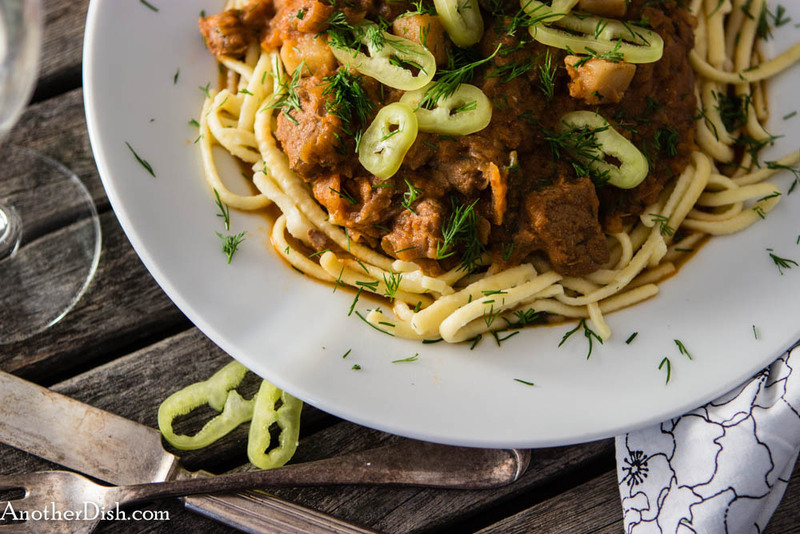 Székely goulash is characterized by its use of sauerkraut and sour cream, and it is delicious! 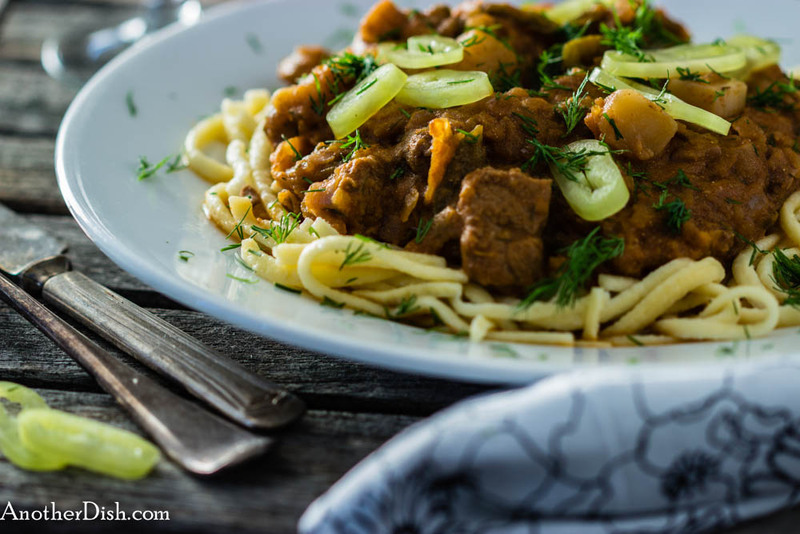 Like many Hungarian recipes, goulash tends to call for lots of fat (lard, etc.). I’ve tried to slim down this goulash without compromising its great flavor by using a lean cut of pork, a small amount good quality, smoked bacon, omitting oil and using reduced-fat sour cream (one recipe I saw called for a slab of bacon and 1/4 cup of oil to brown it in! Yuck!). Anyway, this is a good, hearty dish for a cold winter’s evening. I hope you’ll try it and let me know what you think! Heat bacon in a large Dutch oven over medium-high heat. Cook until brown and fat is rendered, about 4 minutes. Add the pork and saute until browned, about 4 more minutes. Lower heat to medium. Add the onions, bell pepper, garlic, thyme, caraway and salt to the pork mixture. Saute until vegetables have softened, about 7 minutes. Add 4 Tbsp of the stock, together with tomato paste and sweet paprika. Cook for 5 minutes. Stir in sauerkraut, potatoes and apples, and cook for another 5 minutes. Pour rest of the stock into the pork mixture. Increase heat to high and bring to a boil. Reduce heat to low, cover and simmer for 1 1/4 hours, stirring after 30 minutes. Stir in wine, sour cream and paprika. Increase heat to medium and cook for 15 minutes. Remove from heat. Season with additional salt to taste (I added another 2 tsp salt), ground black pepper and hot paprika. Serve over hot spätzle. Garnish with pepper rings and dill. This entry was posted in Comfort Food, Hungarian, Main Dishes, Pork and tagged Comfort Food, Cooking, Food, Food Photography, Foodie, Hungarian Food, Recipes on January 26, 2014 by AnotherDish. Yum! This looks and sounds great! Thanks for sharing.